The speed and scale of business transformation continue to accelerate. With that acceleration is the increasing demand for the IT Infrastructure and Operations team to guarantee 7×24 access all the associated data that fuels this transformation. Providing higher data availability and faster application recovery is now a core part of the IT operations plan. Finding a simple, reliable solution for higher data availability, without impacting performance, has been a challenge for many IT operations. Without a solution in hand, enterprises are facing increasing fines and potential damage to their reputation due to prolonged outages. What’s needed is a solution that is fast, reliable, and as simple as possible. While some current solutions have done a reasonable job satisfying most of these requirements, there’s a better solution that can satisfy them all. The goal is to achieve a recovery point of zero, meaning no difference between the data on the source and the target. The “trick” is how to minimize the latency between the source and the target systems, making it easier to keep the connected systems in sync without slowing down the applications running off of the source system. Reducing network latency is only part of the answer. If the network connection between the source and the target is considered a constant instead of a variable (“it is what it is”), the only room for innovation and improvement is in the replication method and the performance of the two systems. That’s where INFINIDAT has focused its attention, with great benefits. The typical replication process, using a Fibre Channel (FC) WAN, requires multiple communications between the source and the target system to ensure the system is ready before a block of data is sent, stored, and validated. The target system, receiving a “raw” payload also has to determine the best place to store the transmitted data, further adding to the latency. Using IP-based replication (TCP/IP, not iSCSI), we’ve reduced the overhead and capitalized on the ability of the InfiniBox to preprocess the payload at the source and have the target system acknowledge writes from DRAM. This optimized approach to replication eliminates wasted network time and minimizes the data transmission. All this results in the lowest synchronous replication latency available on any enterprise storage system today, with physically adjacent systems testing at 400 µs and distant systems testing at the IP network latency plus 400 µs. INFINIDAT has innovated (yes, we really did something new that nobody has done before) a better way to crack the problem of replication, specifically synchronous replication. While we’ve had asynchronous replication for block storage for years, we knew it would take something truly different to give our customers a better solution for synchronous replication. Did we also mention that the two types of replication are connected? If for any reason, the latency for synchronous replication is impacted, the system will automatically switch over to asynchronous replication until the issue is resolved. When the system determines that the network is working as expected for synchronous replication, it will automatically switch back. Why does this innovation matter? Because it pushes the performance for replication latency to a new standard while reducing cost and complexity. How do we reduce cost? By moving replication off the FC WAN and over to the lower cost IP network. Our replication simplifies the configuration and operation, enables greater redundancy, and lowers equipment costs. 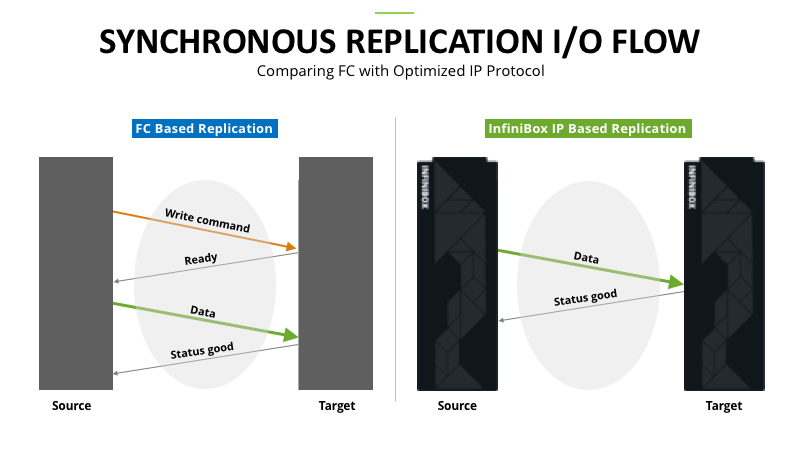 INFINIDAT Synchronous Replication is included with all InfiniBox systems installed with Release 4 at no additional cost. All customers upgrading to Release 4 will get this feature as well. 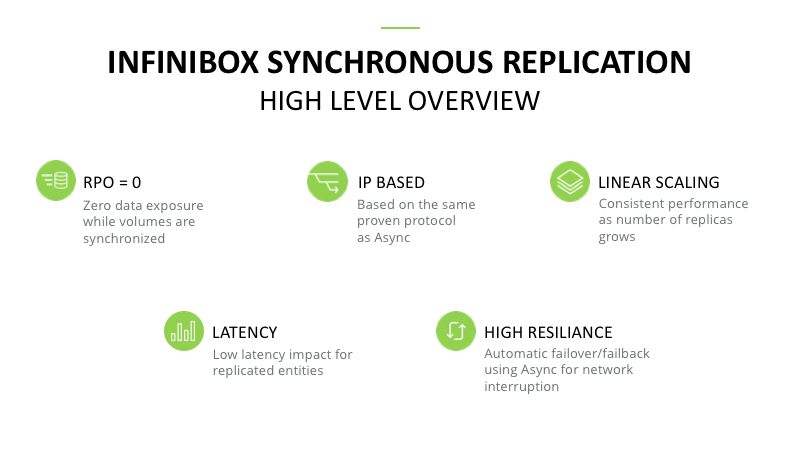 Whether you’re implementing a full business continuance plan or looking to fully leverage assets across multiple data centers, the InfiniBox with Sync and Async replication can help you realize your goals while also helping to stay within your budget. Not sure how this can work for you? Let’s talk! Let us know you’d like to hear more about this solution or check out the rest of our solutions. Anat Rapaport is a Senior Product Manager at INFINIDAT, responsible for defining the direction for data protection, including snapshots and replication, along with the graphical user interface (GUI) and overall user experience (UX). Anat loves the challenge that comes with making typically complex things, like managing and protecting petabytes of storage, as simple as a few clicks. Out of the office, she is a competitive catchball player, representing INFINIDAT in the Israeli Premier League.